Additionally, if something is still in print, Reaper Legendary Encounters for example, and is going to bounce back into availability you may submit it. EDIT: I'm not a judge so don't quote me on this. That's exactly what happened with my Ashi-Dhulu custom. They had low availibility when I submitted, but now there are 102 in stock on their website. It seems perfectly reasonable to me to roll planet of origin up into theme, although I suppose that is for the judges to decide. In any case, I have updated my original posts and included the planet at the end of that category. to review Viceron the Blood Knight. BTW, the submission guidelines in the bylaws state ( and have stated since the beginning) that a submission should "normally include an origin world that is part of the Heroscape canon". Viceron the Dark Knight has received 4 Yea votes to review (Soundwarp SG-1, capsocrates, Scytale, and superfrog) and moves forward in the process. Well I'll be. It's always been there and I've never noticed. Probably because it's almost never done. Interesting. So if your design does not originate from an established world it is automatically disqualified? I suppose that would be up to the judges on how to vote, but I think we can take it that a new world must fit within the canon well enough. I don't think the "Rainbow Sprinkles" planet would mesh terribly well with the rest of the Heroscape, but I hope it could at least be possible to make another world. C3V made Arctorus after all. Yep. Classic 'Scape added planets, too. So I don't think it's a problem to add them in FanScape, but they must fit in with the other existing worlds. Arctorus is a perfect example. Ixe, we were very clear when you were a guest in the C3V that you were not supposed to release our top secret plans like that! Regrettably, I lack a song or quote that I can somehow tenuously link to this fine fellow. So I'll just get right to it. Will Thrangir measure up? Or is he half the custom he should be? Will he survive this punishment and make it into the Soldiers of Valhalla? No real problems here. Thrangir's stats are nothing that impressive for his points, but both his offense and defense are boosted tremendously by his power set. He needs that boost though, as he has no synergies to speak of. Overall, he's just a solid stand-alone figure for his points. I like the overall theme here of a tough-as-nails Champion tearing through the enemy without care for the damage he takes in turn, but there are a few problems here for me. Can't say I'm a fan of using the species name 'Half-Orc', it's a terribly human-centric and silly name, but D&D is officially part of Heroscape, so there's nothing to be done there. Outside of that, the six move never made much sense to me, he's clearly wearing some pretty heavy plate and neither of his parent races have any special affinity for armor that would justify it. The biggest problem I have here is the interaction between Reckless Assault and Resilience, it just feels weird that he can ignore a wound from his own recklessness. I've tried to get a picture of how that works in my mind, and I just can't see it. 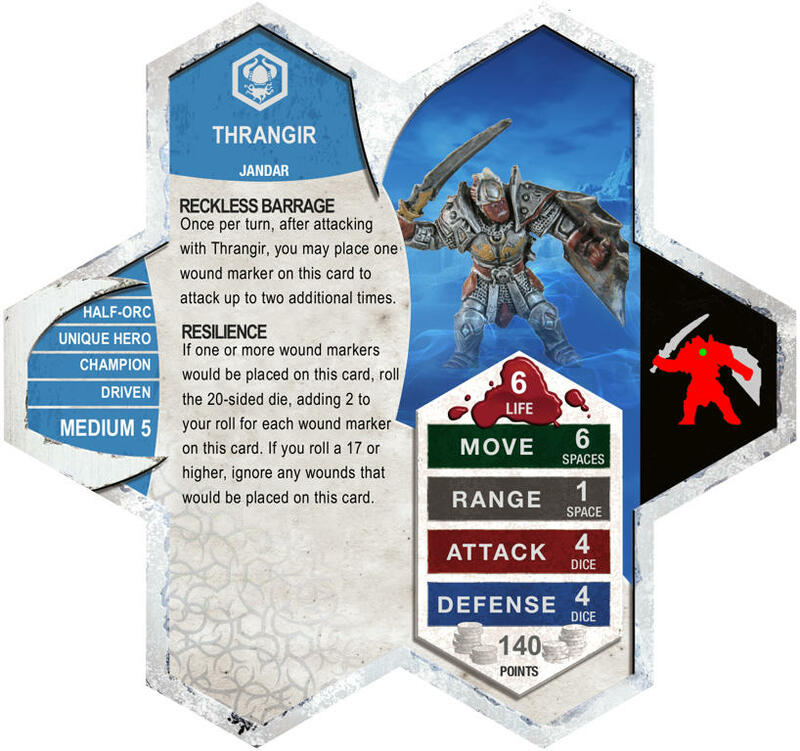 Both Thrangir's powers definitely bring something new to the game, I like the scaling mechanic in Resilience and Reckless Assault can lead to some interesting choices. Overall, a very unique design. I'll admit, I didn't do a great deal of testing here. I gave Thrangir a few games to see how the Reckless Assault/Resilience combo felt in practice, and long story short, it never felt natural. It always played more like a 'cheat' or something that had slipped through the cracks rather than an intentional design feature, and it was surprisingly easy to forget to roll for Resilience after taking the Reckless Assault wound. If I'm still forcing myself not to play it wrong after 5 games, that tells me it's a bit counter-intuitive. Overall, Thrangir brings a lot of interesting things to the table, but the interaction between Resilience and Reckless Assault never felt right to me, and that was just too much to ignore. I vote to induct Thrangir to the SoV. Thanks for giving him a shot. I'm considering a new version, but the Resilience/Reckless Barrage interaction really was the whole point of the design. Since that was the problem, the design is pretty much pointless. When it comes to his stats, Warden 722 is a nicely rounded hero, packing enough punch that he can hold his own as another bonding hero for the Zettian Infantry, without overshadowing the other heroes (well, besides Deathwalker 7000, but that is what it is). Everything in the Zettian Army has its role to play, and Warden 722 fills a nice niche without stepping on any toes. He is, however, rather matchup dependent: against a traditional bonding army I’d rather sink his points into another squad of Infantry, or put them towards a stronger hero, but against an army of solo heroes or unique squads he turns into a potent threat. Warden 722 is solid, so far as his aesthetic theme goes; the miniature looks good amongst the other Utgar Soulborgs, and his left-box stats (particularly his Tormenting personality) mesh well with what we’ve come to expect from a Deathborg. I wouldn’t have a problem with Warden 722’s thematic image, were it not for the odd kink of his special attack. I didn’t think it would be a problem when I started out testing him, but I noticed a couple of discrepancies. The obvious one is that it affects Unique figures, including squads, but leaves Common squads and heroes alone. This leaves the idea of an electrical pulse in a sort of thematic limbo: if we call Electrical Pulse Special Attack’s ability to hit Unique Squads with the loss of an order marker even after the targeted figure was destroyed an arc of electricity, why doesn’t this affect Common squads or heroes? If that’s not what happens, why does the Order Marker removal mechanic affect Unique Squads at all? I’ll expand on my other problem with Electrical Pulse Special Attack in the Playability section. Outside of Electrical Pulse Special Attack’s Unique/Common issue, the Warden shapes up nicely. The defense reduction for Soulborgs and threat of Order Marker removal keep things interesting for Warden 722. The Warden is a nice little rank-and-file Soulborg that keeps its own identity intact. It makes for a nice balance of nuanced design aesthetic and adherence to thematic precedent. The negative point I find so far as creativity goes is that Electrical Pulse Special Attack deviates from the mechanical precedent of order marker removal, such as Crippling Gaze and Psionic Blast Special Attack, both of which affect all figures equally. Much of what I said in the Theme section regarding Electrical Pulse Special Attack originated here, but I thought it an issue with two sides that could be addressed in both sections. Why should a Unique Hero without a bonding squad suffer more penalty from this special attack in the form of a lost order marker than a bonding Unique Hero? This loophole gives traditional bonding armies a distinct advantage over armies comprised of Unique Squads or non-bonding unique heroes when going up against Warden 722 (i.e., the Knights of Weston or the Dreadgul Raiders have no trouble with Warden 722’s special attack, while an army built around Nicholas Esenwein or the Varkaanan Wolf Pack will suffer). Why should the Knights and their champions be able to roll forward despite Electrical Pulse Special Attack while the Undead and Wolves are hobbled? It’s a tricky matter of how the special attack affects one kind of bonding rather than another, and how the theme plays out on the table. In-game, Warden 722’s status as a backup hero for the Zettians is exacerbated against top-tier bonding armies, and he punishes solo Unique Heroes and Squads too much for my taste. I wouldn’t have a problem with this unit if it affected all units equally, or restricted itself to multi-life heroes, but as it is, I can’t reconcile the electricity arcing between unique squads and not commons; the fact that certain heroes get a free pass because their bonding squads are unaffected doesn’t help. As-is, Warden 722’s inability to affect Common units hurts him as well as the armies his opponents put up against him in ways that just aren’t favorable to either. Personally, I’d love to see this unit back, with the special attack dealing Order Marker removal out to all units in equal measure, even if that brings his point value up a bit. I vote to induct Warden 722 into the Soldiers of Valhalla. Thanks for reviewing the warden, guys. Obviously the large majority of the criticism centered around one specific point. There are obvious fixes of course, but I want to take the time to get the pricing right after tweaking it. I'll be back though.